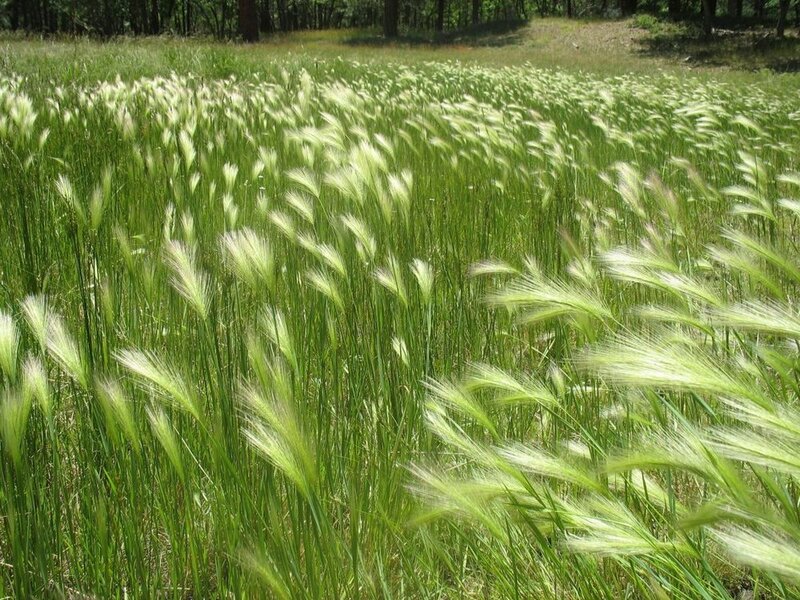 Reasons for concern: The seed heads of this grass have a needle-like bristle at the tip of each seed called an awn, which can be dangerous for livestock and pets because awns can work their way into the animals’ mouth, nose, eyes, and digestive systems. This grass can form large stands that displace desirable native plant vegetation and important wildlife habitat. Special note: Native plants have evolved together over centuries with pollinators, birds, wildlife and other native plants. We may not understand the role this native plant plays in our environment, so we may not want to completely eliminate it. Botanical description: Bunchgrass, distinguishable by its long awns or bristles. Leaves: Leaves are flat to rolled, 1 to 6 inches long. Mature plant has flat leaf blades 1 to 6 inches long, evenly spaced with fine hairs along edges. Stem(s): Slender, erect, or lying on the ground with tips pointed up. Mature plant reaches 1 to 3 feet tall. Seed heads: Uppermost parts of stems have long, fine, needle-like, spreading, barbed awns or bristles, which are capable of burrowing into the soil where they germinate. When mature, seed heads dry up, split apart, and blow away on wind. Seed heads produced from late May to August. Germination occurs in the fall after a significant rainfall. Roots: Shallow, fibrous root system. No rhizomes (horizontal underground stems). Where it grows: Wet or moist places. Grows along roadsides, disturbed habitats, and meadows at elevations of 5,000 to 7,500 feet. 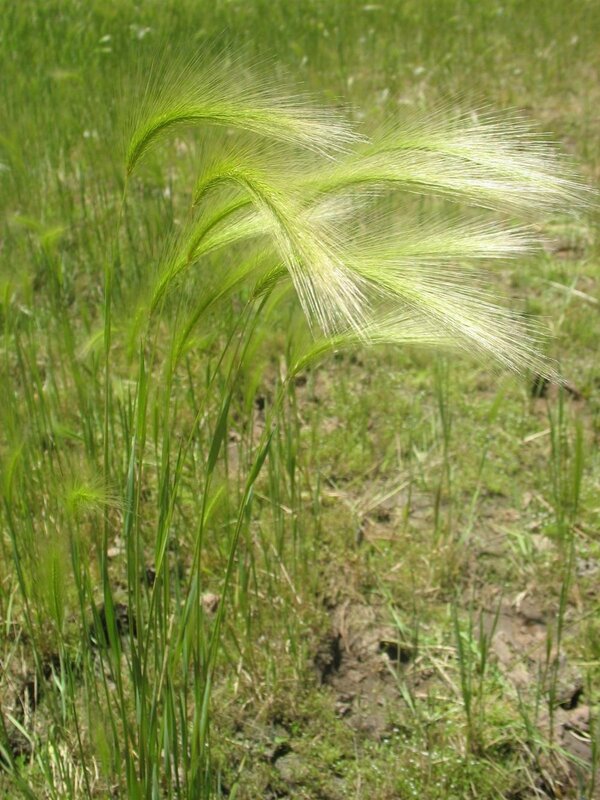 Weedy characteristics: Seeds of this grass are dispersed by wind and by humans and animals to which it clings. 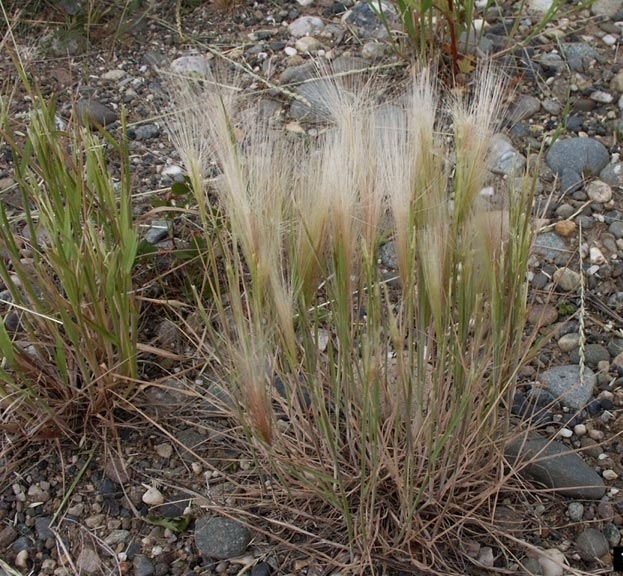 Look-alike native plants: See separate entry for bottlebrush squirreltail grass (Elymus elymoides). Seed heads of squirreltail are larger than those of foxtail barley, and the large seeds of squirreltail can be distinctly felt by the fingers. The barbed awns or bristles at the tip of squirreltail stems are longer than those of foxtail. Foxtail flowers June through August, while squirreltail flowers March through September. Control strategies: Do not let plants drop their seed heads. Cut them off before seeds drop, or thin out the population by digging up plants, being careful not to disturb soil too much. Population can be controlled with tillage.